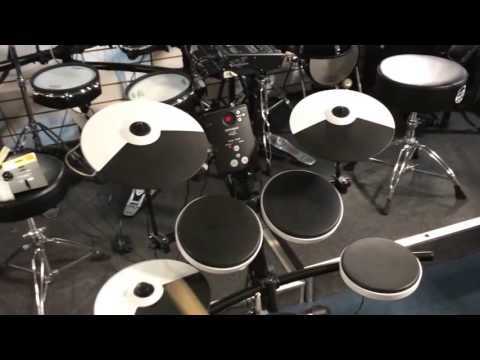 The Roland TD-1K Electronic Drum Kit is a superb, compact entry level drum kit. Packed with great sounds, onboard coaching functions and exp.. The Roland TD-1K Electronic Drum Kit is a superb, compact entry level drum kit. Packed with great sounds, onboard coaching functions and expressive pads. Keep the neighbours happy with this quiet home practice set up. Roland V Drums are the world’s most popular electronic drum kits. That’s simply because they’re great. Featuring well-respected functionality, feel and affordability, the Roland TD 1K is a great beginner kit at a great low price. Roland have spent 3 decades developing electronic kits and it really shows. The result is a range of kits that offer superior sound, authentic feel and rugged durability. With it’s compact, space-saving design, a wide selection of drum kit sounds and fun onboard training and recording functions, this kit will stand you in good stead from beginner to advanced player. Join the world’s finest drummers and percussionists by joining the V-drums family with the Roland TD-1K. 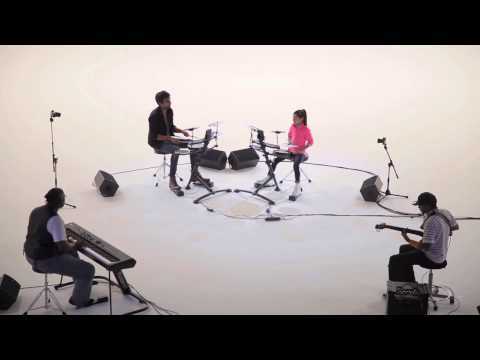 The Roland TD1K drum kit comes packed with sounds. When you buy an acoustic drum kit you only have one sound. Sure you can tune it slightly differently, but ultimately you only have one kit sound. With the V-drums TD-1K you have 15 different drum kits in one! The 15 inbuilt expressive drum kit sounds enable you to play any music style you want, from rock and pop, blues and jazz to dub and EDM. You have a wide range of kit sounds that can be easily changed at the touch of a button ensuring you have the exact sound you want not matter what your style. With it's 15 kit sounds, the Roland TD-1K offers great variety and versatility in one compact kit. Sometimes drummers worry that electronic kits don’t feel like acoustic kits and that this can prevent them from learning essential acoustic playing techniques. With this Roland V-Drums kit, there is no need to worry. Featuring naturally expressive pads, the TD1K electronic drum kit has been specially developed to ensure drummers can still learn the essential skills they would on an acoustic kit. This is especially important for beginners as it’s imperative they start on the right path. Each drum sound built into the kit has a wide dynamic range and natural tone to help create an expressive acoustic-like playing feel. Furthermore, unlike most entry-level drum kits, this electric kit also features advanced expressiveness features that are found in all TD-series modules. From bow and edge sounds to the ability to choke cymbals just as you would with an acoustic cymbal, this kit has a real feel. The hi-hat is also designed to react to the nuances of the drummer’s footwork for a realistic, great playing feel. Start the right way with the Roland TD1K by building the same skills you would on an acoustic kit. Whether you have a regular drum tutor, are teaching yourself how to play or simply want to keep your skill polished, the Roland TD-1K has you covered. This V drums kit is packed with tutorial features that help drummers to develop technique, boost motivation and get the most out of their practice time. The onboard coach function includes 10 different fun, skill-checking features that help to improve timing, groove and beat playing. Things like the ‘Quiet Count’ setting lets you test your internal metronome to see if you can keep in time when the metronome click drops out. Will you still be in time when the click comes back in? Meanwhile, settings like ‘Change-Up’ gradually increase the tempo to see if you can keep up and stay in time. These coach functions allow drummers to improve their skills in a fun way that doesn’t feel like practice at all. A superb way of ensuring you stay on track when it comes to developing as a drummer. The inbuilt metronome allows drummers to tighten their timing, the coach mode enables the building and maintenance of speed, stamina and accuracy, and the recording function allows the ability to easily track progress. Quickly record your practice and listen back to hear if you’re as good as you think you are! Finally mastered that groove you’ve been working on? Record it to share with others to show them the progress you're making. The built-in tutorial features of this kit are useful for drummers of all levels from beginners through to advanced players. It’s always essential to keep on top of practice to ensure you maintain your timing, accuracy and feel in order to become the best drummer you can be. The Roland drums TD-1K kit features a range of built-in songs of various styles allowing you to jam along. Get ready for your first band by practising to lots of different song styles. You can also connect your smartphone or tablet via the mix-in jack input allowing you to quickly and easily play along with your favourite artists and songs. Again the onboard recording function gives you instant feedback on your progress to let you know how well you’re doing and how good you sound. Rock out with your favourite bands or groove along to the best hip-hop tracks, you can do it all with the Roland TD1K. One of the main problems when it comes to practising drums at home is the noise level. It may be fun for the drummer, but not so fun for everyone around them. Complaints from neighbours and annoying the rest of the family can be common. This Roland electric kit allows you to avoid all that. With features like the beaterless kick pedal, headphone output and quiet pads, you can practice as much as you like without bothering anyone. Typically electronic kits will have a bass drum pedal that strikes a pad in the same way a beater would hit an acoustic drum. Although much quieter than acoustic bass drums there is still a definite noise from the beater hitting the bass drum pad. The TD-1K, however, features a beater-less kick pedal which removes the striking sound, to ensure noise is kept to a minimum. Furthermore, the TD-1K has a headphone jack output allowing you to practice away quietly without annoying those around you. Great for early morning or late night practice! The noise-reducing design of the snare, tom and cymbal pads further help to reduce volume for a playing set up that’s as quiet as you can possibly get. Drum kits can take up a lot of space. Space that often you don’t want to give up in your family home. 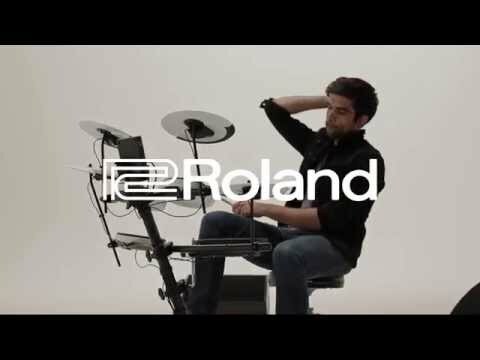 That’s why Roland have designed the TD1K electric kit to be as space-saving as possible. It features an ergonomic design and a stylish look that will suit any room in your home. With it’s slim, modern aesthetic, the Roland V-drum TD-1K is a practical choice when it comes to purchasing a drum kit. The sturdy drum rack, though compact, doesn’t compromise on stability. With easy height adjustment, this drum kit is suitable for children and adults alike. Set it to the perfect height to ensure a comfortable playing position. The cymbal heights and snare pad angle can also be adjusted to suit your playing style for further comfort. This kit is ideal for beginners but is equally suited to experienced drummers. Whether you’re just starting out on your drumming path and want a kit that will grow with you or you’re an advanced player that needs a small home practice kit or set up for backstage warm-ups, the Roland TD-1K drum kit is an ideal choice. As you develop as a drummer your requirements may change. Roland have specifically designed their Roland TD1K kit to ensure it stands you in good stead from beginner through to advanced player. That’s why they’ve enabled the kit to grow as you do with additional upgrade options that can be added to the kit as your needs change. With these electric drums, you have the ability to add an extra crash cymbal or can change the kick pad to a more advanced option. With optional extras like the OP-TD1C cymbal pad, KT-10 or KD-9 kick pedal pads that are used in higher end v-drum ranges you have the ability to change your set up as and when you need to. Other upgrades included the TDM-3 v-drum mat, ideal if you’re planning on taking your kit out to gigs, or the PM-3 personal drum monitor which is perfect if you want to share your playing with others or ensure you can hear yourself clearing during performances. With a wealth of additional extras (sold separately), this Roland drum kit is truly a set that can develop as you do, accompanying you along your drumming journey for years to come. The TD-1 sound module of this Roland kit features a USB-MIDI output which allows you to easily connect your kit to the computer. This opens up a whole world of new options. From the DT-1 drum tutor which is a fun, dynamic platform for learning notation and essential drum techniques, to V-Drums Friends Jam Series which has a host of jam tracks, practice features and the ability to compete with V-Drum users around the world. The USB-MIDI feature also allow you to connect the electric drum kit to any computer music software enabling you to record your beats to a professional standard. Whether you want to record your beat ideas, add a groove to your favourite song or play a drum track to your own music, the Roland TD1K gives you the option to do it. There’s nothing worse than purchasing a drum kit and then having to spend an hour or so reading the manual to figure out how it works. Roland know this, that’s why they’ve designed the sound module on the Roland TD1K to be as user-friendly as possible. The intuitive user interface is the complete opposite of complicated. Even if you aren’t very tech savvy the clear layout and info displaying LED screen allows you to access all the functions quickly and easily. The result is a kit that you can set up and use immediately straight out of the box without any prior experience and without needing to read the manual. The ultimate in easy-to-use interface design. With its natural feeling, expressive pads, a variety of realistic drum kit sounds, intuitive onboard coaching features, noise reducing, compact design and easy to use sound module, the Roland TD-1K electronic drum kit is a superb choice for drummers of all levels. Whether you’re looking for your first drum kit or you want a home practice set up for use between gigs, this Roland V-drums kit is a cost-effective way to practice efficiently. The ability to upgrade the kit with additional extras and the facility to connect the kit to a computer make this an electronic drum kit that will develop as the drummer does. The Roland TD-1K is a high-quality electronic drum kit at a superb price that has bags of functionality to ensure drummers continue to progress from beginner onwards. Plus, the neighbours will thank you for not getting an acoustic kit!